Why did she write the book? Conferring with parents, teachers, and talented children on a daily basis, Laura realizes that guidance and motivation are necessary ingredients for becoming a writer. As she says, “Everyone needs realistic advice about becoming a professional writer.” With daily requests from literary fanatics to help them overcome the obstacles they face while penning their books, Laura finds that she does not have time to help everyone individually. 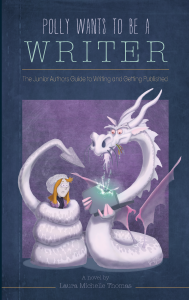 She wrote Polly Wants to Be a Writer to act as a guide book for these young writers. Laura sums up the book as a Young Adult fantasy novel which is designed to help a young author come up with an idea and then build up to the point where they have a fully polished story ready to be published. Laura describes the relationship between herself and her students as “walking together step-by-step through the writing process: from idea to formatting and submission.” She hopes that her readers connect with the protagonist, Polly, who struggles with obstacles along the road to getting her short story written. What obstacles did she face? Time was a major problem for Laura when she started writing her book. Giving it priority over her paid work, even though she could not be sure about selling a single copy of her book, shows her true dedication to the cause of helping young authors. What advice does she have for those who want to write a novel? Above all, Laura says you need to know the part of you which criticizes your writing and use it to help you decide weather you are ready to write a novel. In her book, this part of you is called your “inner dragon” and is brought to life through one of the main characters: Polly’s albino dragon named Scrum. Amna Gillani is a 13 year old writer from Pakistan.